m a y f i l e s . . .: First "Tubby"
Berkeley had her first "tubby" last night. Let me tell you, it was a true spa experience. These nurses know how to do it! 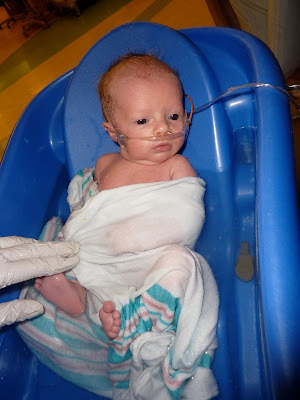 I thought I knew how to bathe a newborn, but I had no idea. We start by wrapping up in a blanket, and immersing in warm water. This eliminates the flailing arms, and exposed limbs. Each little arm or leg is taken from under the blanket, separately and washed, rinsed with pouring of warm water, and replaced. She was then wrapped in another warm blanket, outside of the tub, as we washed her hair. Her head received yet another warm blanket, and we were finished. That is about a full load of wash per bath, but Berkeley appeared to be in heaven throughout. Berkeley also received a special visit from Mimi, who is in town for the remainder of the week. Without her two Grandma's we would be lost. Two big milestones today: back to birth weight and a full feeding. Oh so sweet. When Daegen was in the hospital we learned so much I was grateful for the one on one time with the nurses. We learned sooo much. She looks like she is doing great! love her already. Hooray for a full feeding! That's wonderful news!